“The best writer of sports books in America today” (The Boston Globe) tells a thrilling story of friendship, football, and a fight for justice. 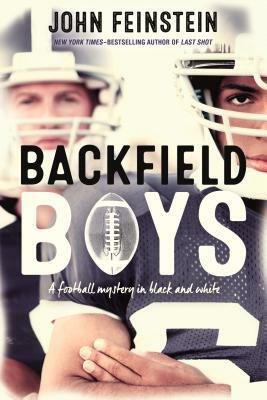 Renowned sports journalist and New York Times–bestselling author John Feinstein’s young adult novel Backfield Boys follows best friends and football stars Jason Roddin and Tom Jefferson, a perfect, though unconventional, pair: Jason, the Jewish kid, is lightning fast and a natural wide-receiver, while African-American Tom has an amazing arm and a quarterback’s feel for the game. After summer football camp at an elite sports-focused boarding school, the boys are thrilled to enroll on scholarship for their freshman year—despite their mothers' fears of injury and especially CTE. On day one, they’re stunned when the coaches make Tom a receiver and Jason a quarterback, a complete contradiction to their skill sets and training. Suspecting deep-seated racial bias, the boys speak out, risking both their scholarships and their chance to play. Soon local newspaper reports begin a secret investigation, and as tensions rise Jason and Tom must decide how much they're willing to lose in their quest to expose the ugly remnants of a racist past that still linger in contemporary jock culture.